Does your project require high-precision, cutting-edge distance, speed, motion, and/or gesture sensing? We're not talking ultrasonic, or even infrared here, but 60GHz radar! Say hello to our tiny, pulsed radar friend the Acconeer A111! 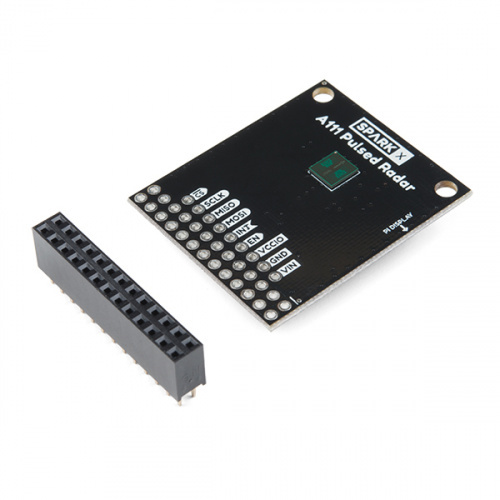 The A111 is a single-chip solution for pulsed coherent radar (PCR) -- it comes complete with antennae and an SPI interface capable of speeds of up to 50MHz. Applications for PCR include distance-sensing, gesture, motion, and speed detection. The sensor can monitor one-or-more objects at distances of up to two meters. To use the A111 you'll need either an ARMv7 or an ARM Cortex-M4 -- the closed-source SDK currently only supports these architectures. This tutorial will explain how to use the radar sensor with a Raspberry Pi -- a platform based on an architecture supported by the A111's SDK. The A111 Breakout includes a 20-pin, 2x10 female header, which should mate to Raspberry Pi's of any generation. If you'd rather manually wire the A111 to your Raspberry Pi, male headers and about 9 male-to-female wires should do the trick. This tutorial assumes you've already set up a Raspberry Pi with Raspbian. For help installing the Debian-based OS on your Pi, check out the docs on Raspberrypi.org. Or -- better yet! -- check out our Headless Raspberry Pi Setup tutorial. You'll also need to enable SPI on your Pi. For help with that, check out our SPI on Pi tutorial. 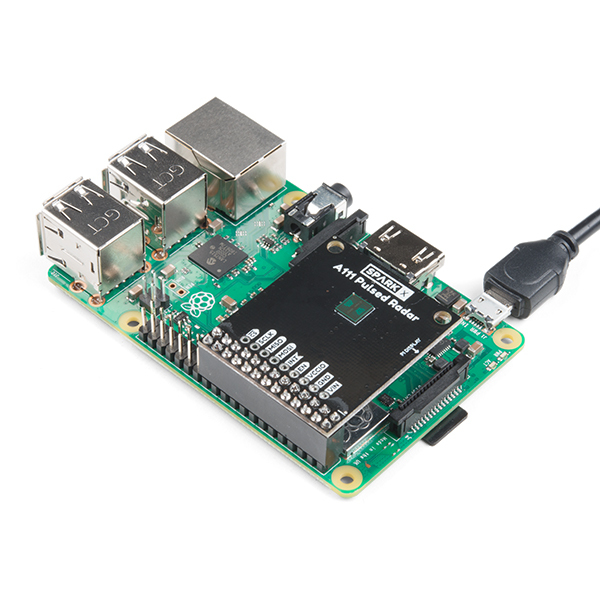 The A111 Pulsed Radar Breakout is designed to sit directly on top of a Raspberry Pi. It doesn't span all 40 (2x20) pins of a Raspberry Pi B+ (or later), but the 26-pin -- 2x13 -- header should be compatible with any Pi. Solder the 2x13 header so the female side is facing away from the greenish-black A111 IC. Then connect the shield to a Raspberry Pi ensuring that the "Pi Display" text on the breakout matches up with the display header on your Pi. The sensor should be facing up after plugging it in. ⚡ Input Voltage and Logic Levels: This board breaks out both "VIN" and "VCCIO" pins. "VIN" should power the sensor, which can consume up to about 80mA. "VCCIO" sets the I/O voltage, which may be lower than VIN. The Raspberry Pi pin breakouts, for example, connect VIN to 5V and VCCIO to 3.3V, as the Raspberry Pi's 3.3V bus may not be able to fully power the A111, but the Pi can only handle 3.3V I/O. The software development kit (SDK) for the A111 is, unfortunately, locked behind a closed source blob that currently only supports Cortex-M4 and ARMv7 platforms. To download the SDK, visit Acconeer's "Products" page. Towards the bottom, under the "A1 Software Development Kit" header is a link to GET SOFTWARE&ast;&ast;. Read through the license, agree, and then request the A1 SDK for Linux ARMv7 software. 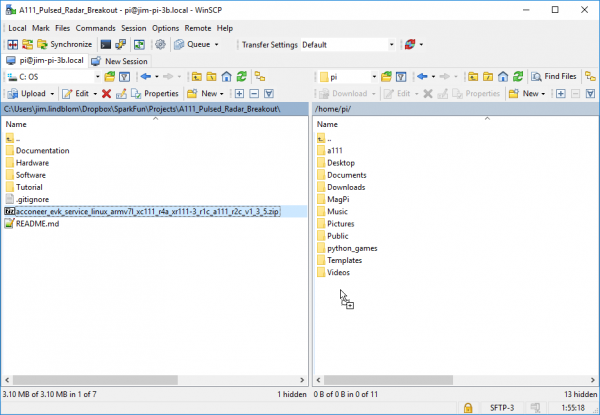 Once downloaded, you'll probably need to transfer the ZIP'ed SDK over to your Pi. To achieve this, we recommend SCP. If you're on Windows, WinSCP works very well for transferring files from one device to another. Note: Make sure you replace "192.168.0.100" with your Pi's address or localhost name. Then cd to the "a111/evk_service/..." directory to prepare to build the example software. doc -- Doxygen-generated documentation for the A111 API and source code. include -- Header and API files which describe how to interact with the pre-compiled A111 libraries. lib -- Pre-compiled A111 static archives. 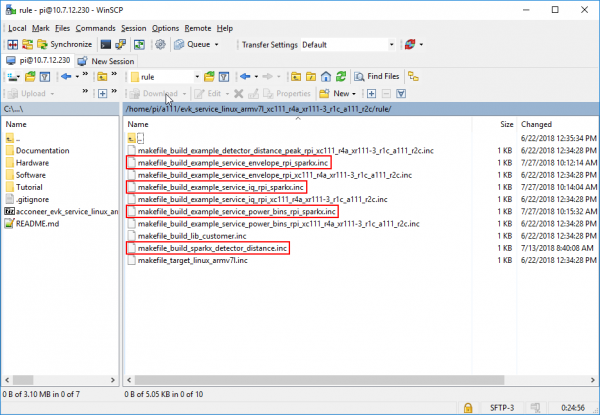 API for these files are provided in the "include" directory. out -- Compiled board and example object and executable files. rule -- Recursive Makefile rules for board and example files. source -- C source files for custom boards and example applications. makefile -- Top-level makefile. Recursively calls files in the "rule" directory to build example and board files. If you copy this ZIP file to your home directory, this command will unzip it to the right directory (assuming your SDK was unzipped to: "~/a111/evk_service_linux_armv7l_xc111_r4a_xr111-3_r1c_a111_r2c". rule/makefile_build_sparkx_detector_distance.inc -- Build rules/Makefile for the sparkx_detector_distance.c source file. rule/makefile_build_example\_\*\_sparkx -- Build rules/Makefile for the sparkx-breakout example files. source/acc_board_rpi_sparkx.c -- Board definitions -- pin connections, clock frequency, etc, for the SparkX A111 Breakout. source/sparkx_detector_distance.c -- Modified distance detector source file. Example of SparkX example files added to the "rule" directory. (Don't forget the "source" directory files too! Once uploaded to your Pi, executing the make file -- and it's recursive dependencies -- should build all of the examples you may use with the A111. 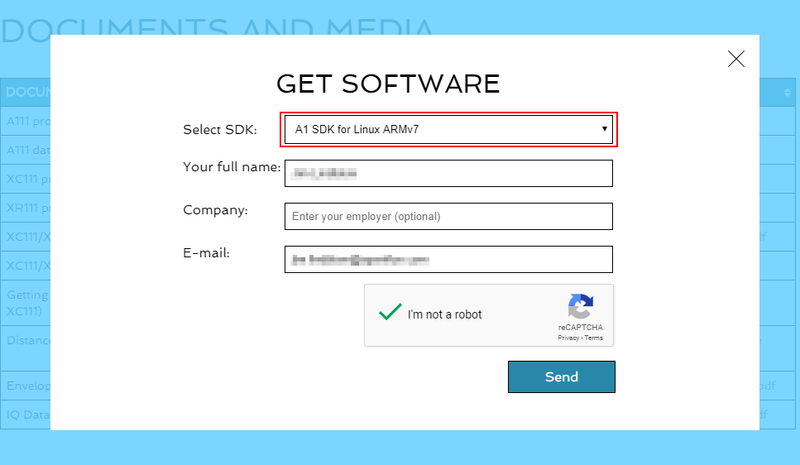 To build all board and example files, navigate to the SDK's top-level directory and type make. This will run our modified distance-detector example application. This application will begin by calculating raw peak-distances, with a maximum of ten reflections. 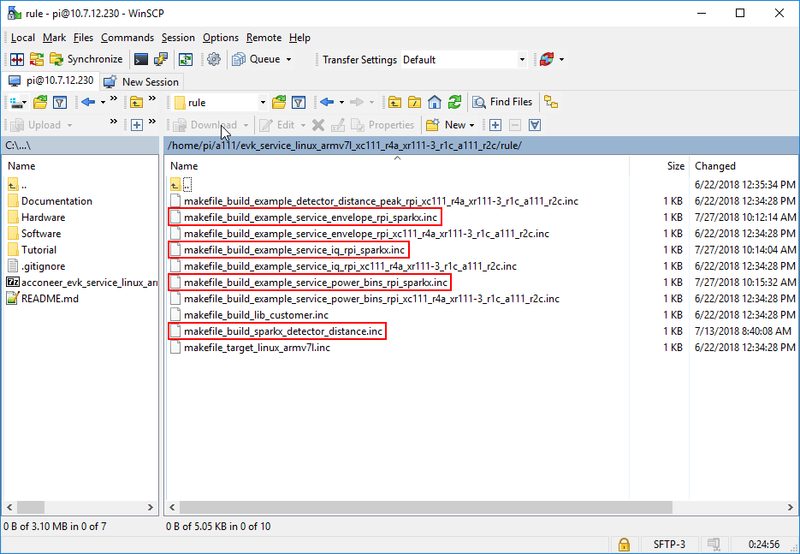 Following about 125 samples, the example will briefly estimate minimum and maximum thresholds, then continuously monitor for nearby objects until CTRL + C is pressed. Reflections: \<r> -- r is the number of reflections -- a value between 0 and 10 -- visible to the A111 sensor. Seq. nr \<n> -- This number -- n -- should increment with each successive measurement. (200-700m) -- This is the set measurement range of the A111 sensor. \<d0> mm (\<a0>), \<d1> mm (\<a1>), ... -- dn in this example is the distance of reflection n and an is the amplitude of that reflection. sparkx_envelope_service_example -- Reads in the envelope data, which us usually further-processed and used in distance, measurement, or other types of algorithms. sparkx_envelope_iq_example -- Advanced version of the envelope service, which includes phase information for very small variations in distance. Acconeer: A1 Radar Sensor Product Page -- SDK, user guides, and datasheet.